From L to R Maury Crotteau, Al Lundgren, Ed Viveiros and Bob Ledoux. Maplewood Machine was presented a flag that was flown on board the U.S.S. Battleship Massachusetts and certificate for our support in the restoration efforts on the ex-USS Joseph P. Kennedy Jr. DD-850. DARTMOUTH — Maplewood Machine Company, a Dartmouth-based manufacturer, was recently recognized for its quality products by Raytheon Ingegrated Defense Systems, a leading national defense contractor. 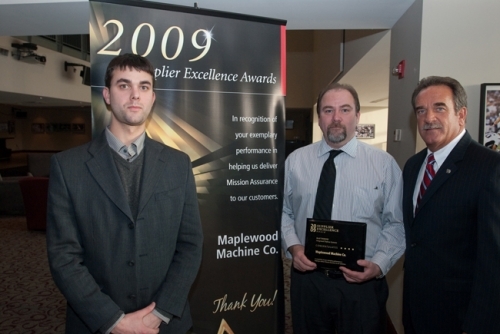 "When you get an award like this, it's a huge milestone," said Edward Viveiros, president of Maplewood Machine Company. Viveiros received a Supplier Excellence Award from Raytheon during a recent ceremony. Raytheon held the event to recognize suppliers that excelled in several areas that include on-time delivery, commitment to continuous improvement practices and quality of performance. Out of 3,000 suppliers, Raytheon awarded 83 companies. Founded in 1982, Maplewood Machine Company has manufactured components for torpedo tubes and mine-hunting devices used by military personnel overseas. The company is also being tasked to create parts that will be used in the U.S. Navy's new line of destroyers, which will be known as the Zumwalt class. "We make a lot of machine parts and components that will go to upper assemblies," said Viveiros, adding that the company also does a lot of work in the commercial sector. In 2008, Viveiros moved the company from Fall River to its present location at 973 Reed Road in Dartmouth. The new facility is 7,000 square feet and includes a large working area for employees to manufacture components to the specifications that the company's customers expect. Viveiros said his business has managed to survive the rough economic times since the 2008 financial crisis. He recently attended a two-day defense contractors' conference in Washington D.C., and met with aides for U.S. Rep. Barney Frank and U.S. Sen. Scott Brown to discuss business policies. "We need to be able to save jobs and save businesses to keep them afloat," Viveiros said. 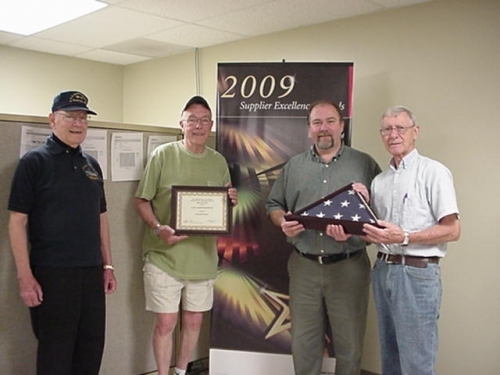 On March 2, 2010 Maplewood Machine Co. Inc. was presented a 4 Star Supplier Excellence Award from Raytheon by Vice President of Operations and Integrated Supply Chain Dan Ryan. The Operational Excellence Supplier Conference was held at Gillette Stadium in Foxboro, MA. From (L to R) Josh Viveiros, Edward Viveiros and Dan Ryan.